More from Rothenburg ob der Tauber in Germany, a delightful city on the romantic road. For many students of mine this wonderfully preserved city was their favorite during our travels. It was in many ways what I think we Americans hope Europe is like. The left figure is from the Imperial Museum, but was a carved statue taken from St. Jacob’s Church where we went to a concert later that evening. While there I drew the statue of St. Christopher that was near us. We kept running into his image throughout our trip, and couldn’t help thinking he was looking over our trip, making sure we were getting along well. 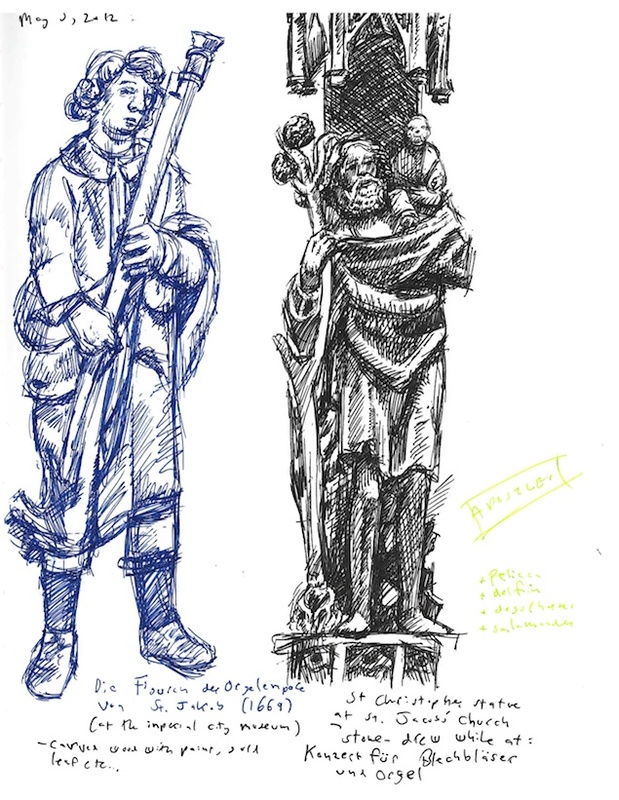 This entry was posted in Thoughts and Sketches and tagged art journaling, drawing, drawing as prayer, Imperial City Museum, rothenburg ob der tauber, sketch, sketchbook, sketchbook images, sketchbook keeping, sketching, St. Christopher drawing, St. Jacob's Church, Tim Timmerman. Bookmark the permalink.